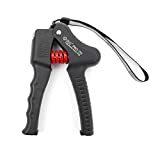 Hand grip strengtheners are an awesome tool to have in your fitness toolbox and they are actually incredibly affordable. These handheld grippers can help you build forearm, finger, hand, and wrist strength. They can be used as a rehabilitation tool after injury or illness. Or they can be used to help you make big gains in strength and to add some bulk to your forearms. I created a list of 8 of the best hand grip strengtheners available after doing a lot of research and testing. Take a look at this year’s picks for the best hand strengthener below and add one of these great tools to your arsenal. Captains of Crush is the most well-known brand in the hand gripper industry. They’ve been around since 1988 and they’ve built up a solid reputation for having a trustworthy product that gets the job done. This classic, nice-looking silver gripper is extremely durable, thanks to the billet aluminum and alloy steel construction. It’s available in a range of 11 strengths, from 60 lbs to 365 lbs. Captains of Crush recommends that you buy three different strengths, one for warm-ups, one for your work sets, and one for challenge work. This 3-gripper method will ultimately lead to the biggest and quickest gains. The Captains of Crush grippers are ergonomically designed and fit pretty comfortably in the hands. The grip feels pretty rough and can definitely lead to calluses or can even rip up your skin. For some, this may be a good thing but it can be a turn-off for others. Wearing gloves when using these, like those designed for weight lifting, can help minimize the risk of your skin getting painfully torn up. These are tough grippers that will keep working well over a long period of time, but they do have the tendency to start squeaking. Using a little WD-40 should help if this annoys you. The simple, classic design looks great. They come in a wide range of strengths, 60-365 lbs. Captains of Crush is a trustworthy brand with a long tradition of excellence. The grip is great for building calluses and doing crushing/crunching work. Plenty of legendary athletes and bodybuilders have crushed their way to strength with this brand. They have the tendency to squeak. If your hands sweat a lot, they may start to rust over time. The rough grip can lead to blisters and painful tearing of the skin. It’s sold individually, rather than in a set of two. If you need a solid, premium hand strengthener that can adjust to your needs as you go, this may be a good option worth considering. It allows you to start at the level of resistance that you’re most comfortable with and slowly work your way up for long-lasting results without injury. Your progress won’t be limited with this tool because you can continuously improve your grip with the adjustable settings. It functions as a six-in-one tool and can take the place of multiple hand strengtheners. It also features totally silent operation so you can use it as you travel or at work without bothering anyone or drawing unwanted attention to yourself. The solid steel spring makes it a durable option that can be used for years and years. On the downside, this tool is a bit more expensive than many similar products. It also seems to show wear over time which is disappointing because the solid steel spring really is very durable. Adjustable – You can adjust the weight of this tool from 55 to 198 lbs so there’s no limit to the progress you can make. Solid steel spring – The solid steel spring has been designed to last for years. Silent operation – this hand strengthener is very quiet so you can use it pretty much anywhere. Expensive – This is the rolls royce of hand grippers, compared to some similar options, this one is expensive. Shows wear – while the solid steel spring os very durable, the other components of this hand strengthener tend to wear out over time. Verdict: If you need to build your grip strength and want to progress over time without buying multiple devices, this is a pretty good option to look into. It’s a six-in-one tool that allows you to build up weight resistance over time. It’s also very quiet so you could potentially use it anywhere. It has a solid steel spring that will last and last. On the downside, it costs a bit more than many similar options. Additionally, while the steel spring is very durable, the other mechanical components of this device seem to wear out over time. Here’s a simple yet effective hand strengthening tool that can be relied on for a very long time. It has a contoured handle that is easy to hold and squeeze. You can adjust the weight settings of this tool easily for smooth and effortless hand strength training. It’s also completely silent so you could use it at home, at the gym, at work, or on vacation. It does a great job of improving your forearm muscle tone as well and is virtually indestructible. It’s almost entirely crafted out of thermoplastic nylon and steel, so you can use it every day for years and years without it wearing out. This is also a very safe option. The adjustable settings don’t slip and the specially designed shape keeps you from accidentally pinching or injuring yourself. The best part of this hand strengthening tool, however, may just be its price. This gripper comes at a lower price point than many other similar products while still having high quality and design standards. For that reason, we feel that it is a great value. 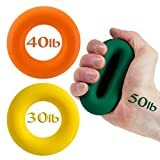 As far as drawbacks go, this hand strengthener only goes up to 154 lbs. This means that if you want to really take things up a notch eventually, you’ll need to buy a gripper with a bit more resistance. Other than that though, it’s a pretty impressive strength training tool that will likely last for years and won’t hurt your wallet. Great value – This hand gripper comes at a fantastic price. Durable construction – Designed with steel and thermoplastic nylon, this tool is virtually indestructible. Silent – This hand strengthener operates silently. Adjustable – you can easily adjust the weight settings of this device for smooth and effective strength training. 154 lb limit – This device only allows you to reach 154 lbs of resistance. Verdict: If you’re looking to effectively and smoothly improve your grip strength, this tool is a great option. It’s durable, silent, and comes at an amazing value. On the downside, it only allows you to reach 154 lbs of resistance. If you are really trying to push things to a new level, you’ll need to get a device with higher weight resistance limits. Other than that, though, this is a durable and reliable tool that fits most hands comfortably and will last for years. This is a nice looking hand grip strengthener with a simple, classic design. You have your choice of colors, including black, blue, yellow, pink, and silver. You also have your choice of resistance levels, from 50 to 350 lbs. The handle is non-slip, great if your hands tend to get sweaty. Another feature that is great for sweaty hands is the rust-proof spring. On some hand grippers, sweat can lead to rust and that can shorten the lifespan of the product, but that definitely won’t be a problem with this one. The more you use this, there is a tendency for it to start to get a bit squeaky, but it’s nothing a little WD-40 can’t take care of. It is an ergonomic design, meaning the position of your hand will be comfortable and there won’t be any unnecessary strain that could cause injury. These are well constructed and should last a long time but if it doesn’t, xfitness offers a 100% lifetime guarantee. They are pretty affordable to begin with but it’s nice to know that if they don’t stand up over time, you’ll be able to get a replacement. There is also a no questions asked money-back guarantee within 60 days if you try the gripper and it isn’t for you. This makes it a great choice for your first gripper. You can give it a try without worrying you’ll be stuck. The handles are also not necessarily the most comfortable and will probably lead to calluses, but that’s exactly what you want when doing crushing or crunching workouts. You have your choice of resistance levels. You can select from several colors. The aluminum handles are non-slip. There is a 60-day no questions asked money back policy and a 100% lifetime guarantee. The resistance level is marked on the bottom. The handles aren’t super comfortable. It can be a bit squeaky. It’s sold individually rather than as a set of two. To get the most out of hand strengthener training, you will typically want to own more than one gripper. You’ll want one for warming up, one for the bulk of your workout, and one for challenging yourself. As your grip strength improves, you’ll typically have to keep buying new grippers at one strength level up. The GD Grip Pro-70 eliminates the need to buy several grippers by offering seven different strengths in one adjustable model. This offers incredible value and makes it really convenient. You can warm up on the 55 lb. setting and then just turn the knob up a few clicks and work out at the 101 lb level. This quick adjustment between resistance levels also makes it possible for people to share the gripper even if they aren’t at the same strength levels. In addition to the high-value convenience of the adjustable strengths, these grippers also offer some other nice features. The handles are plastic so they won’t rust and they aren’t painful to grip. The plastic does have a non-slip ridged design. Even though the ridged design will prevent some slipping, the plastic will get slick if your hands sweat a lot. You can remedy this by applying some athletic tape to the handles or by using weight lifting gloves. This gripper is also potentially safer because it compresses the steel spring rather than stretching it like most other grippers do. The compression system will never lead to the spring suddenly snapping as you can sometimes see happen with other grippers. Finally, this gripper is one of the most consistently quiet one on the market. This 7-in-1 gripper will be ideal for most people looking to build strength in their forearms, fingers, and wrists, but it will be quite uncomfortable and maybe impossible to use for those with really small hands. Most men will find it works perfectly but some women will struggle with the size. It is really seven grippers in one at a range of resistance levels. It has a safe spring compressing design. There’s no risk of rust. The plastic handles can get slippery when sweaty. There is no lifetime guarantee or warranty. It won’t work well for small hands. This is another tool that lets you exercise individual fingers. There are five different resistance strengths to choose from at a range of 1.5 lbs to 9 lbs. Unfortunately, you are not able to adjust the resistance level for each individual finger. Rather, there is one tension setting that is used on each finger. It is extremely small in size which makes it convenient for carrying around with you. The small size makes for a potentially cramped and ergonomically-unsound position with no options to adjust the grip position. This tool uses piston technology, so the mechanism is much like pressing on the valves of a trumpet. Not coincidentally, this tool can be very helpful to musicians who want to improve finger strength, especially in weaker fingers. It’s also a helpful tool for athletes (my friends over at 301gym, a muay thai camp in Sam Roi Yot, Thailand makes use of this one to improve beginner’s hand strength and grip). The Gripmaster can also be used to help improve shooting control, accuracy, and weapon retention. For these reasons, the Gripmaster has been used by federal agents in the FBI, DEA, and ATF. If it’s good enough for those guys, it’s good enough for the average Joes and Janes as well. There is a choice of five tensions from 1.5-9 lbs. It’s quite small and easy to carry around with you. It comes with a complete exercise program to help you get the most out of it. This is a tool of choice for federal agents to improve shooting skills. The strength is the same for each finger. The design will be uncomfortable and potentially dangerous for people with large hands. With a lot of hand sweat, it could get slippery. Iron Crush offers something completely unique to the hand gripper space. Rather than a trainer with handles that you squeeze together, these are silicone rings that you squeeze together in the way you would squeeze a stress ball. Sold in a set of three different resistance levels, these rings fit comfortably in an adult-sized hand and can lead to fantastic results. You can use the rings in a few different ways: crushing (squeezing in the palm of your hand), pinching (gripping with your fingertips and squeezing), and extension (inserting your finger through the ring and pushing fingers outward). If you’re wondering about how durable silicone could be especially when treated to regular force, you might be surprised to learn these are practically indestructible. Iron Crush is so confident in this that they offer a 2-year 100% money back warranty. If your crazy strength ever leads to the rings ripping, tearing or breaking, they’ll happily give you your money back. One thing about these rings that is a bit confusing is the resistance levels. They are measured in pounds, just like most other hand grippers, but they aren’t necessarily equivalent. The pound-rating on the rings is much lower than it should be. The 80 lb. ring, for example, really feels more like a 150+ lb. gripper. This is something to keep in mind. Unique silicone rings are a great contrast to other grippers on the market. They are very tough and durable. They have a great 2-year warranty. They come as a set of three different strengths. They are small and can easily fit in a pocket. The strength ratings aren’t equivalent to the strength ratings on other grippers. Your dog or your kid might think it’s a new toy for them! Do hand grippers actually work to build forearms? Yes! The primary way to build forearm strength and musculature is by working on grip. Forearm muscles are used to control the fingers. Exercises that focus on finger grip are the key to building forearm muscles. There are a few different ways you can do this including things like varying how you hold weights you’re using for other exercises. Using a hand gripper, though, is an easy and direct way to work on your forearm muscles. By using hand grippers consistently over time, you can expect to see your forearms bulk up. Your grip strength and overall hand strength will also improve from regular hand gripper use. Will I burn calories with a grip strengthener? Yes, using a grip strengthener does burn calories. After all, just about every activity burns some calories. Using a hand gripper definitely burns more calories than just sitting around but it doesn’t compare with the number of calories burned during a really intense workout. The forearm and finger muscles are relatively small which is one reason you won’t get a huge calorie burn. With consistent use, though, exercising with a hand grip will add a nice bit of extra oomph to your total weekly calorie burn. Can they help with carpal tunnel syndrome? Hand grippers won’t help with carpal tunnel syndrome, at least at first. In fact, it’s important to not overdo your hand gripper training because overuse could lead to carpal tunnel syndrome or make the existing condition much worse. A hand grip strengthener training program does help build strength and when done correctly, it can help prevent something like carpal tunnel. If you have carpal tunnel syndrome, it won’t help right away and it could make things significantly worse. Once you start to get your carpal tunnel syndrome under control, then you can start to ease into using hand gripper exercises again. Careful use of hand gripper training can be part of a successful carpal tunnel syndrome rehabilitation program. Do you think it can help lower blood pressure? There is a lot of evidence that strength training can help lower blood pressure. Hand and forearm strengthening exercises like those done with a hand gripper certainly fit into this category. Like with calorie burn, it might not make a huge difference but it can definitely move the needle in the right direction. How often should I use my hand gripper? It depends on your end goals, but generally, you should approach hand grip training like you would any other kind of strength training. In other words, you need rest days and this isn’t necessarily something you should be doing every day. Training every day probably won’t hurt you but it also won’t accelerate your progress. When you’re doing an intense hand gripper workout, three days a week is enough. If you’re using hand grip training as part of a rehab program, you may want to exercise with the gripper every other day. Just be careful not to overdo it as that can just exacerbate your injury and it will set you back instead of expediting your healing process. It’s always a good idea to check with a doctor before beginning a hand gripper program and follow their advice about how frequently to exercise. How to pick which one to get? Choosing the best hand grip strengthener for you depends on a number of factors. #1 What kind of Hand Gripper is best for you? First, consider your goals to decide what type of gripper you’ll need. Are you looking to build overall strength and add a little forearm bulk? You’ll definitely want a hand gripper with a traditional design like the Captains of Crush. If you’re looking to build strength in individual fingers, like for rock climbing or playing guitar/piano, you should look for a model that uses finger action like the finger master. 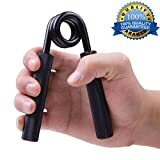 If you’re hoping to use a hand grip strengthener as part of a rehabilitation program after an injury or to help build strength due to things like carpal tunnel syndrome or rheumatoid arthritis, you should make sure to choose a gripper with a solid ergonomic design and a comfortable grip. #3 How much strength resistance do you need? The next thing to decide is what strength level to get. Most trainers recommend that you use at least a few different strengths. Using a model with a lower resistance level can act as a warm up to get the muscles warm and ready for some work. Your main gripper should be a strength level that you can squeeze all the way shut but that you can barely finish a set of 12 repetitions with. If you can do 12 reps no problem, you’re using a gripper that is too easy for you. As you get stronger, you’ll have to keep graduating to the next level of Hand gripper. Using a grip strengthener that is too easy for you won’t do you any good, other than as a warmup. Some trainers also recommend that you own a third gripper, one that is quite a bit too hard for you. This lets you sometimes push yourself and test yourself. But how do you know what strength to start with if you’ve never used one before? Ideally, you will find someone who owns some to try them out. This would give you a basic idea of what 50 lbs. feels like versus 200 lbs. If that’s not an option, one nice thing about hand grip strengtheners is that they’re all pretty affordable. Some models are a bit more expensive, but you can find solid Hand grippers for really great prices. Buying a few doesn’t break the bank so the trial and error method might be worth your while. The best option for you, though, might be to buy one of the hand gripper models that is adjustable. A few of the models on the list above are fully adjustable and let you work out at a number of different strength levels. Beginners, seniors, and anyone using the gripper as part of a rehab program should definitely start with the lower end of strength levels. The rest just comes down to personal preference. If comfort is important to you and you’re not interested in toughening up your hands, you might select a gripper with a comfortable handle or you might choose the Iron Crush Rings. Color doesn’t really make a difference in the performance of a hand gripper but we all know that certain objects just make us happier because they are our favorite color. If that sounds like you, you might want to choose one of the hand grippers that come in several different colors. I hope this guide was helpful and that it has helped you decide which hand grip strengthener to buy. Hand grippers really are powerful little tools that can help you build a ton of strength or can help you safely rehabilitate from an injury or health condition. Have you tried any of these hand grippers? Are there any awesome hand grip tools missing from this list? Let us know in the comments! 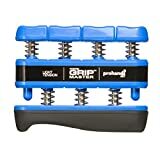 I have wrist pain (joint) after bench press, are there any benefits to using hand grippers? Hand grippers won’t directly improve your wrist pain. However, they can help. There are no muscles in the wrists but the joint pain you experience can be mitigated when the supporting muscles in the hand and forearm are strengthened. Better grip strength and forearm strength will help create more wrist stability. This, in turn, should reduce the joint pain you experience after doing bench press or other exercises. When experiencing significant wrist pain, you should start with a hand gripper with less resistance. Don’t start out with the hardest one as this could make your wrist pain worse. A hand gripper with less resistance will help you increase your strength while improving the overall stability of your wrist. While adding hand grippers to your routine can only help, it’s also important to make sure there aren’t any problems with your form. When gripping a bar or dumbbells with improper form, you can exacerbate wrist pain. You can certainly add a hand gripper plan to your routine to improve wrist stability. However, if you continue to work out with poor form, the pain will likely continue. If you fix your form and add a hand gripper routine, you can expect to have much less wrist pain or maybe even no wrist pain at all. Hand grippers vs wrist curls to build forearms – what is going to be more effective? If your only goal is to build bigger forearms, you’ll be best served by wrist curls. Building big forearms needs wrist flexion, something you don’t really get with a hand gripper. That said, hand grippers certainly can help you boost your forearm strength which will also help you to bulk them up. Hand grippers are good for when you want to improve your grip strength while also strengthening your forearms. With hand grippers, grip strength will be the main objective with forearm bulk being secondary. With wrist curls, building your forearms will be the main objective with grip strength being secondary. If you only have one goal, it’s smart to choose one or the other. But what if you want to significantly improve your grip strength while also adding significant bulk to your forearms? The best solution is to utilize both hand grippers and wrist curls. You can easily incorporate both types of exercise into your training routine.